It took the well-known Austrian painter Hundertwasser more than seven years to complete this masterpiece, which subsequently has been manufactured by EPOS as a limited edition in 1993. The case of the pocket watch consists of blacked 18 carat gold. 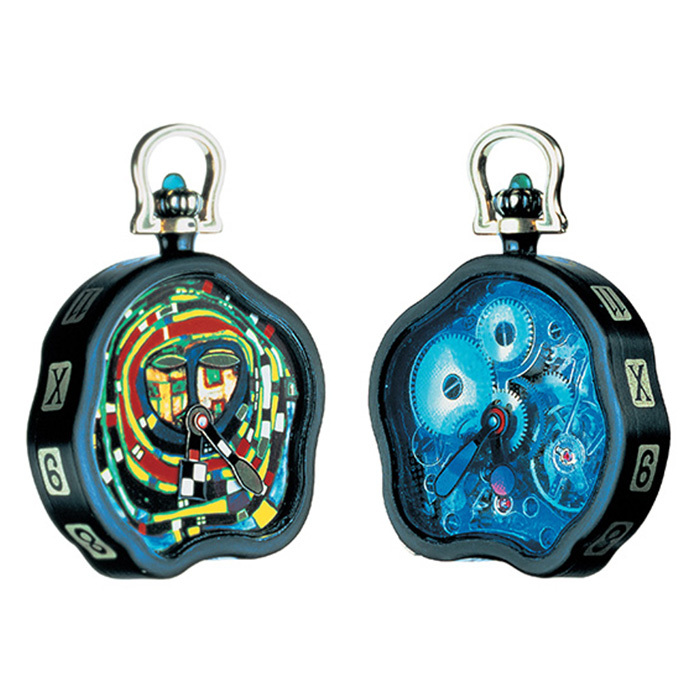 The watch is held in the typical Hundertwasser designs. The watch sports two pairs of hands, thus showing the time in two different ways, true to the philosophy of the artist. 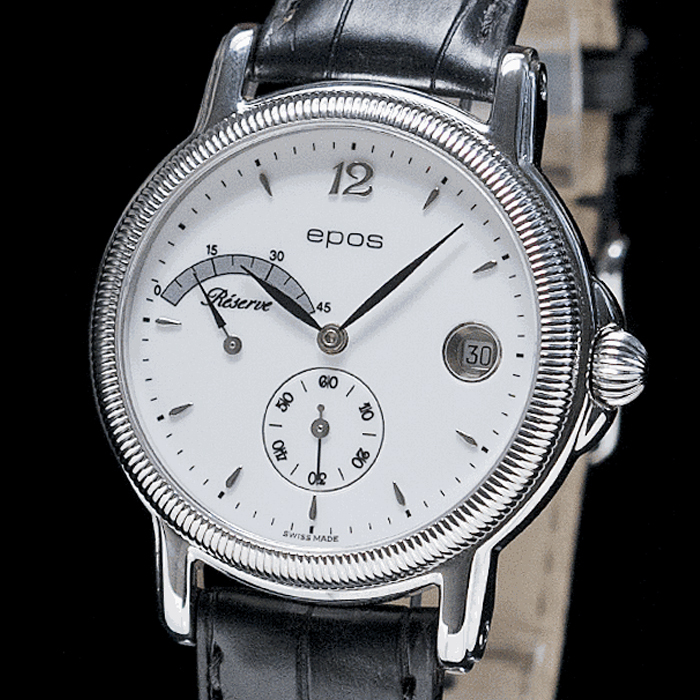 With the Vertigo, EPOS presented a special double-sided watch. An innovative system allows the watch to be turned while remaining on the wrist, revealing a nicely decorated AS 1727 movement via the mineral see-through back. Based on a Peseux 7046 hand-wound movements, EPOS equipped this model with a power reserve indication at 9 o’clock. The elegant design of the stainless steel case gives this watch a classy look. 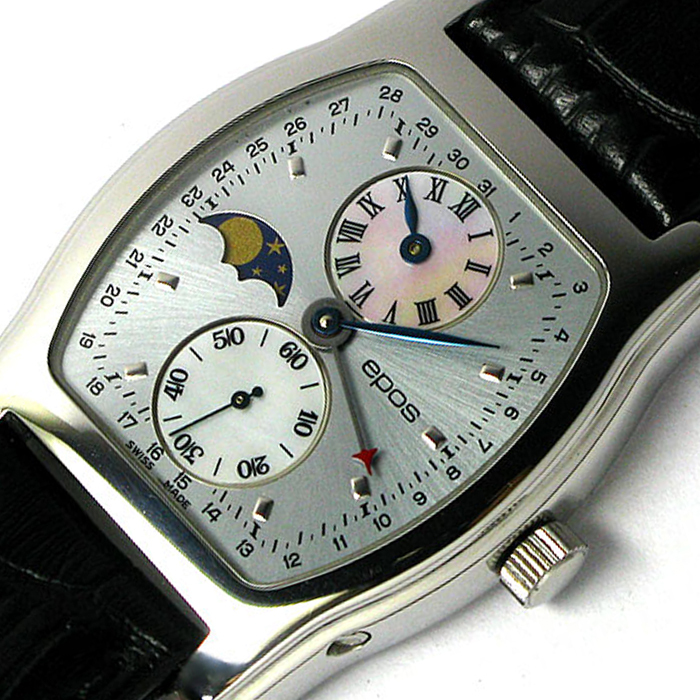 World’s first regulator with moon phase, based on a vintage movement Peseux 7046. Richly decorated movement with blued screws. 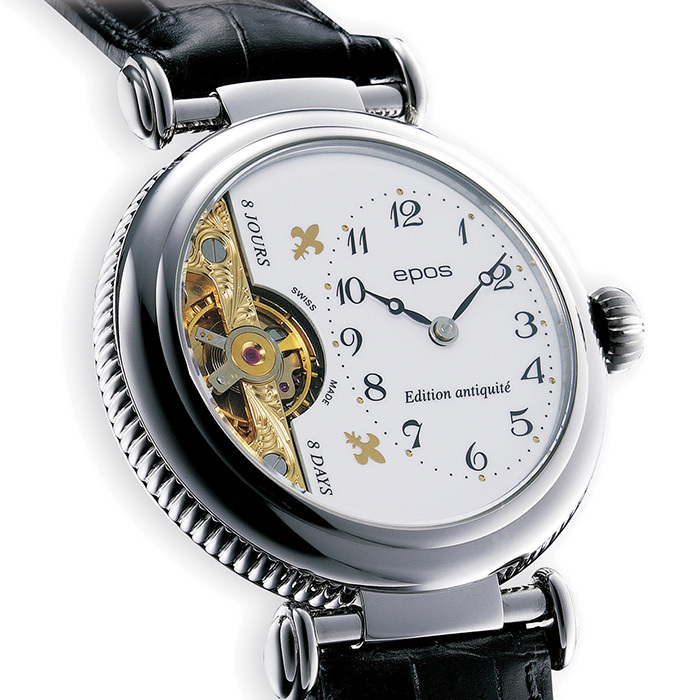 Another great in-house innovation from EPOS: This mechanical masterpiece is based on a hand-wound Unitas 6498 movement. Making use of drawings of historical vintage movements from Venus S.A., EPOS engineers have modified this movement with a big date indication at 12 o’clock. The beautifully finished interior can be seen through an open case back: a beautiful movement with blued screws and Côte de Gèneve. This masterpiece is based on a more than a century old vintage Hebdomas movement. It is hand-wound and has an 8-days power reserve. The mechanical beauty can be seen through a semi-open lacquered dial that is housed in a stainless steel case. 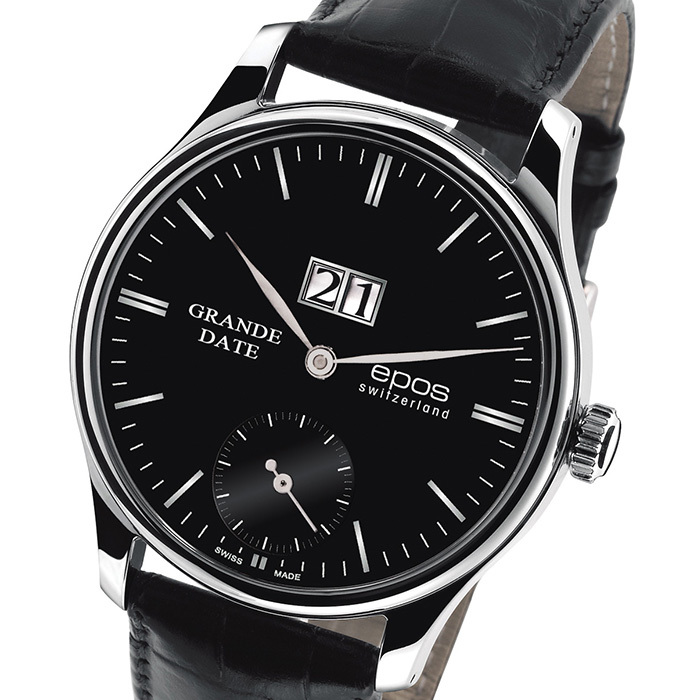 The unique design has given the EPOS brand its distinctive look for many years. Amongst others, this model has won the prestigious German “Goldene Unruh” award for being the most beautiful watch in its class in 2004. Exclusive special edition, limited worldwide to 200 pieces. Based on a mechanical self-winding movement ETA 2892 with luxury finish with the “perlage” pattern and blued steel screws, this watch has a five-minute repeater function with pusher for repeater mechanism at 8 o’clock. 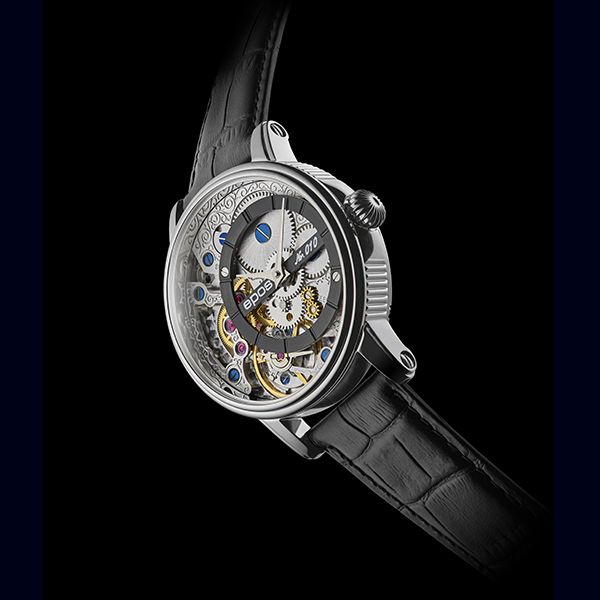 The mechanism is housed in a numbered stainless steel case 316L with domed sapphire crystal and see-through back. The decorated movement and repeater-mechanism are visible through partially opened black dial with applied luminous indexes. The Art of Tourbillon is the incarnation of watch making culture. 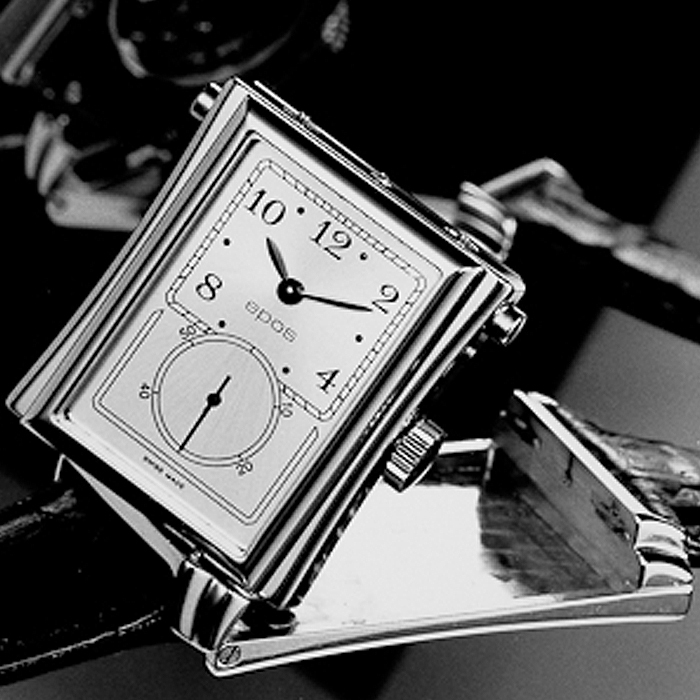 It is the symbol of the traditional craftsmanship, requiring exclusively the hand and care of the best watchmakers. Such a technical prowess deserves watch lovers’ attention and owe to be in the most prestigious collections. 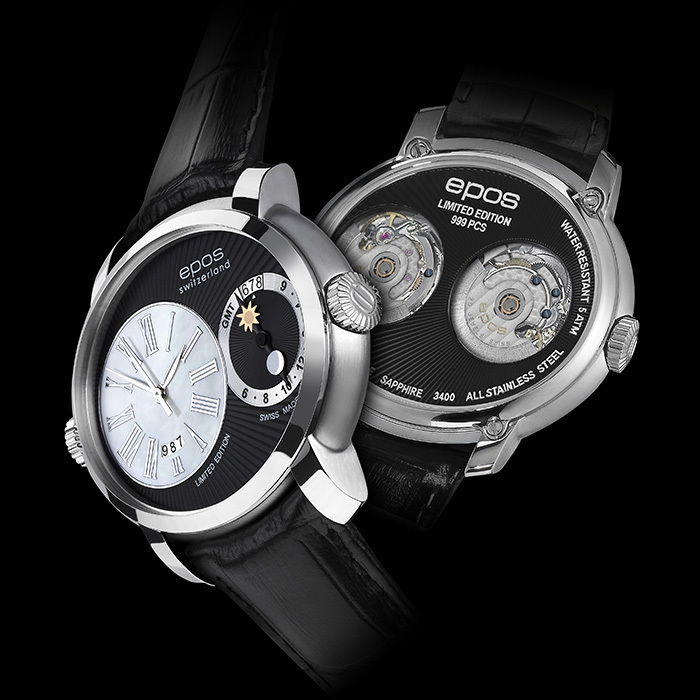 EPOS’ watch making passion has lead to producing these few masterpieces of an extraordinary complexity. 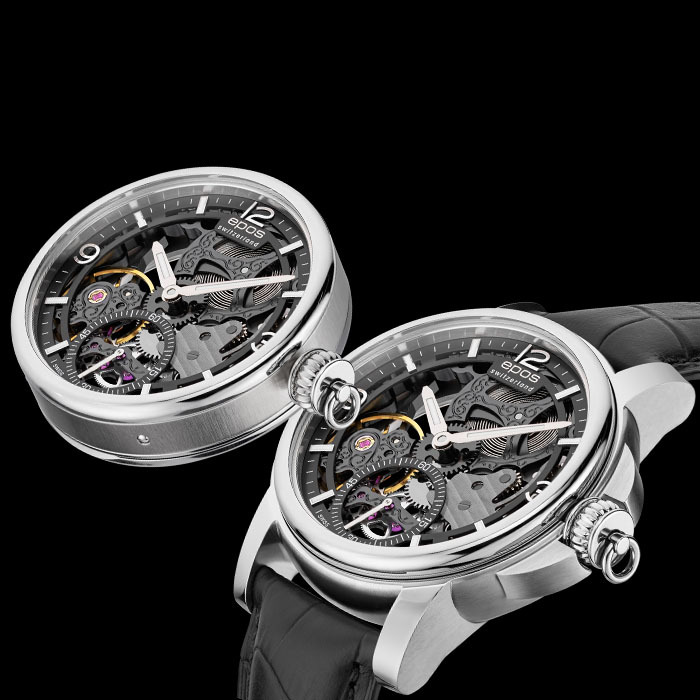 EPOS flying tourbillon is hand engraved, and features a mechanical pallet fork. 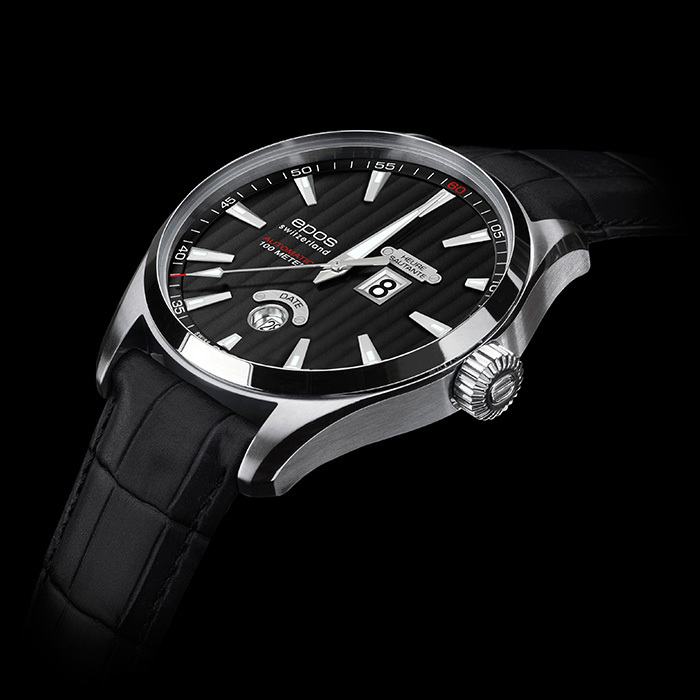 It is a hand-winding watch, with a power reserve of 110 hours. A round opening in the classically designed dial allows to observe the movements of the tourbillon. In addition to the usual second, minute and hour hand, an extra small hand is positioned at 12 o’clock, whose function is to indicate the date. All the magic of the impressive tourbillon movement is unveiled by a see-through caseback. Unique worldwide: vertical big date display at 9 o’clock. The outstanding design and the highly sophisticated mechanical development makes this collection unique. 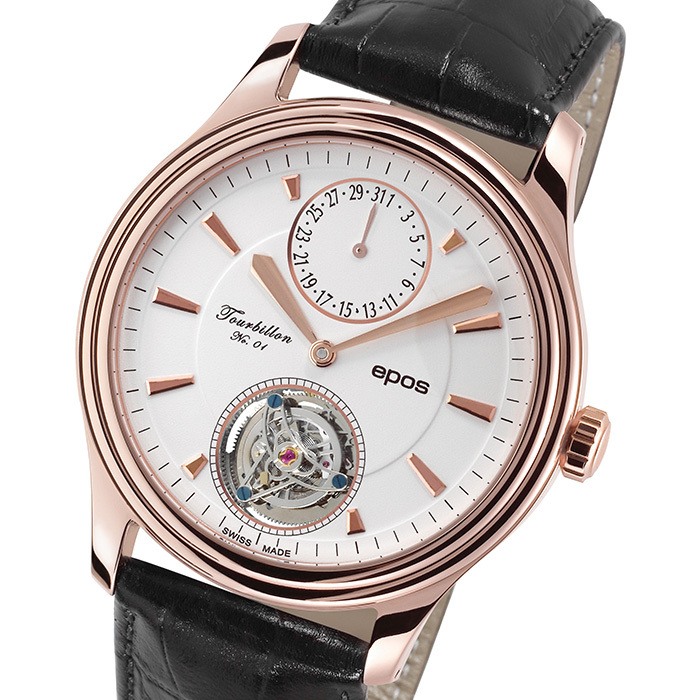 The see-through back shows a wonderfully finished watch movement, another masterpiece by EPOS. Our new in-house innovation, the big date with vertical display at 9 o’clock, is an ‘homage’ to the traditional artistry in watch making. 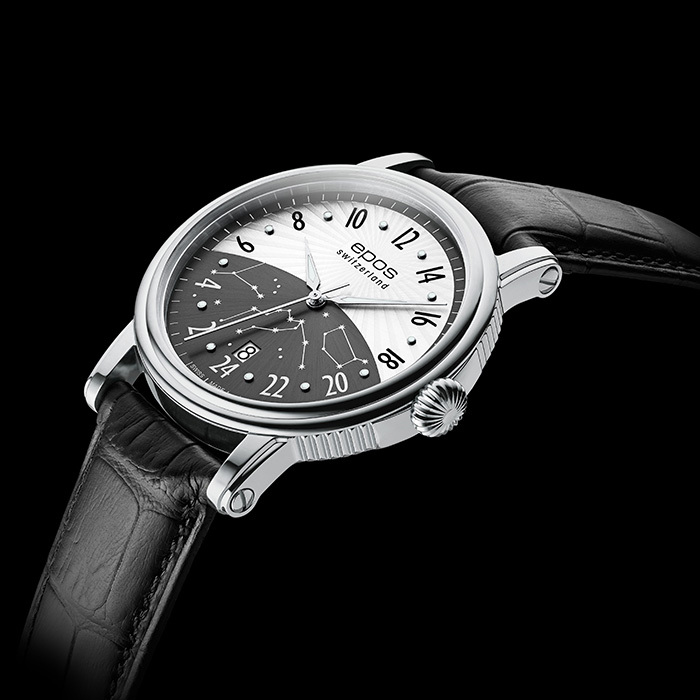 It is constructed on drawings of historical vintage movements from Venus S.A. and finally modified by Epos. EPOS’ exclusive in-house development. Based on an automatic movement ETA 2892 and modified by EPOS’ own engineers, this masterpiece accompanies you through the day with a full dial 24 hour time indication. Date indication at 6 o’clock. Stainless steel case and sapphire crystal, screwed see-through back. The dial is sub-divided in a day and night section, making it easy read time quickly, with a wonderful illustration of the starry sky and applied luminescent indexes. 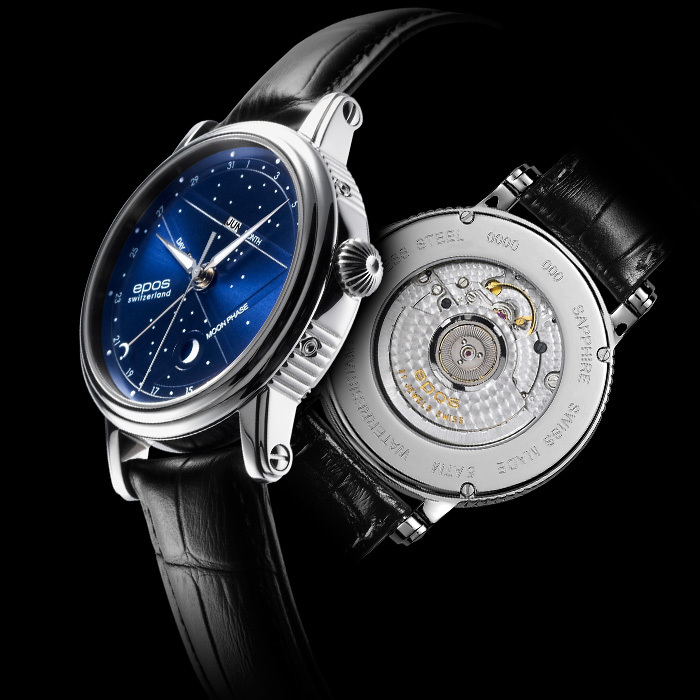 This model is a modern interpretation of the classic moon phase indication, in the design of a clear night sky. The mechanism is based on a mechanical self-winding movement ETA 2892 which is nicely decorated. The watch displays the phases of the moon, date-pointer, day of week and month. It has a stainless steel case with sapphire crystal and screwed see-through back. Special edition, limited worldwide to 999 pieces. Two independent mechanical self-winding movements display simultaneously the time in two different time zones: ETA 2671 for local time and lokal date indication. ETA 2671 modified by Epos with inverse 24-hour-indication for 2nd time zone with date indication (world novelty). The watch has a oval stainless steel case with sapphire crystal and screwed see-through back. The guilloché decorated dial is black with white mother-of-pearl and applied roman figures. This EPOS innovation is based on a mechanical self-winding movement ETA 2892 which is decorated with the “perlage” pattern. Modified in-house, the EPOS engineers equipped this model with a calendar at 6 o’clock and the jumping hour at 3 o’clock. The watch has a stainless steel case with anti-reflective, scratch-resistant sapphire crystal and a screwed see-through back. 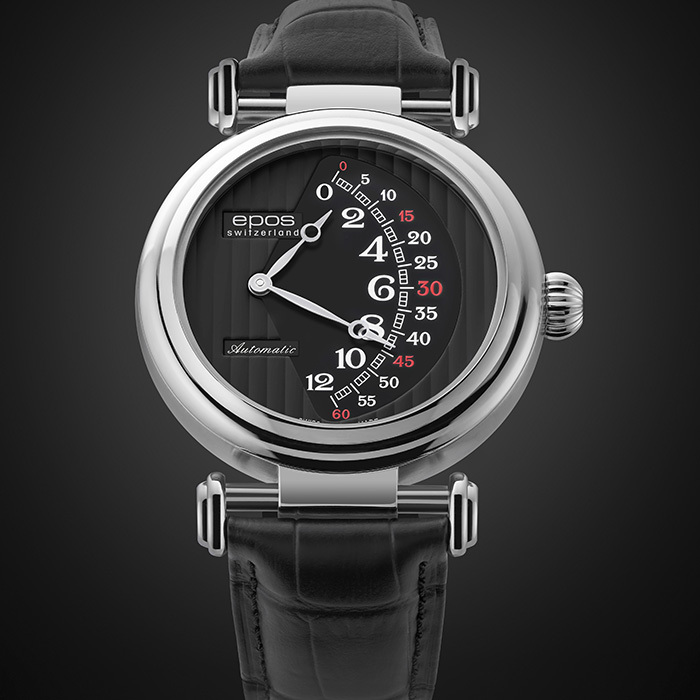 The black dial is carefully decorated with the “Côtes de Genève” pattern. The exclusive special edition is limited worldwide to 2015 pieces. This EPOS construction allows the timepiece to be either carried as a pocket watch, worn as a wristwatch or to be used as a table watch. 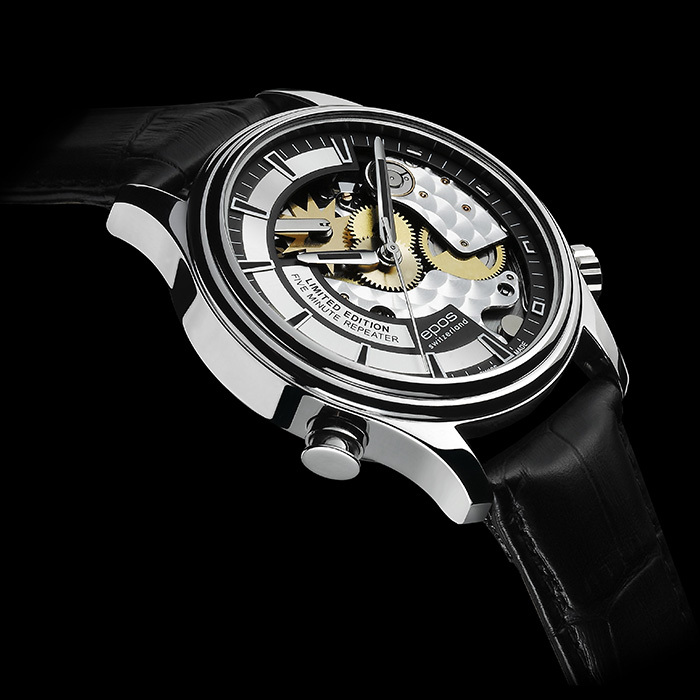 The watch has a mechanical hand-wound skeleton movement Unitas 6498 that is carefully engraved. A small second is displayed at 6 o’clock. The case is stainless steel with sapphire crystal and see-through back. The dial comes with applied arab figures and luminescent indexes. Based on a richly decorated mechanical self-winding movement SW 200, this extraordinary model sports a retrograde module. Retrograde hours and minutes. The case is stainless steel with curved sapphire crystal and a see-through back. 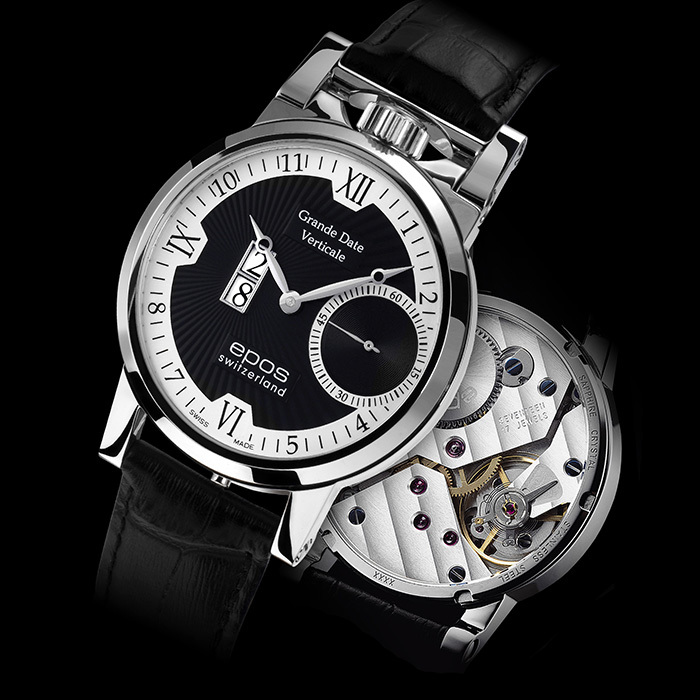 The dial is decorated with Cotes de Gèneve. This masterpiece is limited to 888 pieces worldwide. Exclusive special edition, limited to 999 pieces. Mechanical hand-wound semi-skeleton movement Unitas 6497, decorated and engraved. The beautifully finished backside of the modified movement shines in the spotlight on the timepiece’s front. The small second on the timepiece’s back assumes the function of a pulsometer.